Japanese two-year-olds are indulged, dependent, and undisciplined toddlers, but by the age of six they have become obedient, self-reliant, and cooperative students. 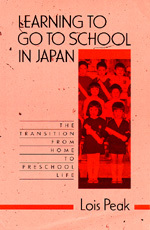 When Lois Peak traveled to Japan in search of the "magical childrearing technique" behind this transformation, she discovered that the answer lies not in the family but in the preschool, where teachers gently train their pupils in proper group behavior. Using case studies drawn from two contrasting schools, Peak documents the important early stages of socialization in Japanese culture. Contrary to popular perceptions, Japanese preschools are play-centered environments that pay little attention to academic preparation. It is here that Japanese children learn their first lessons in group life. The primary goal of these cheerful--even boisterous--settings is not to teach academic facts of learning-readiness skills but to inculcate behavior and attitudes appropriate to life in public social situations. Peak compares the behavior considered permissible at home with that required of children at preschool, and argues that the teacher is expected to be the primary agent in the child's transition. Step by step, she brings the socialization process to life, through a skillful combination of classroom observations, interviews with mothers and teachers, transcripts of classroom events, and quotations from Japanese professional literature. Lois Peak earned her Ph.D. from the Harvard School of Education and has received post-doctoral research fellowships from the Social Science Research Council and the Spencer Foundation.